I’ve always loved the light and refreshing flavor combination of lemon and coconut, and this ultra moist Coconut Lemon Cake from Scratch does not disappoint! 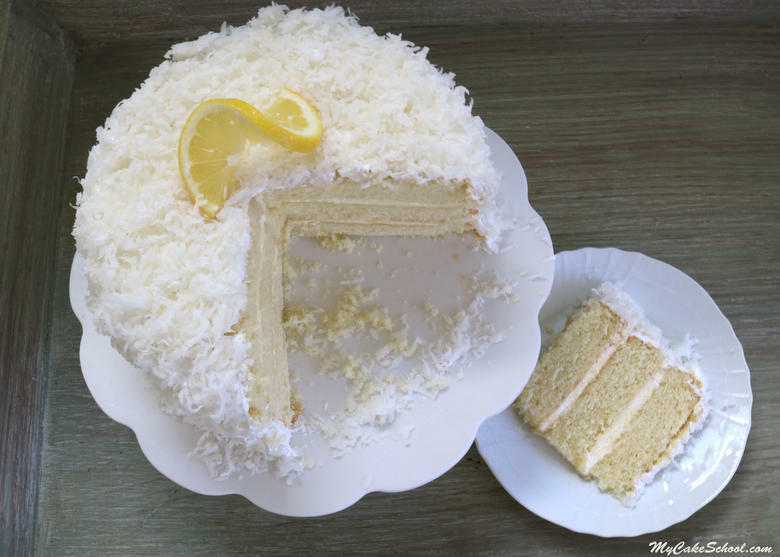 Our traditional Coconut Cake recipe from our Recipes Section uses homemade yellow cake layers with a coconut filling and frosting. Today’s recipe is different in that we are using coconut cake layers, which are flavored with coconut milk and coconut extract. These flavorful coconut cake layers are much like the layers in our Piña Colada Cake, just without the rum and with a hint more coconut extract. We’ve used the Reverse Creaming Method for this coconut cake recipe which yields an extremely soft and moist cake. We wanted to add lemon to the recipe in a way that would perfectly complement the coconut without being overpowering. As much as I LOVE lemon cakes, our goal was to have a nice balance of flavors. 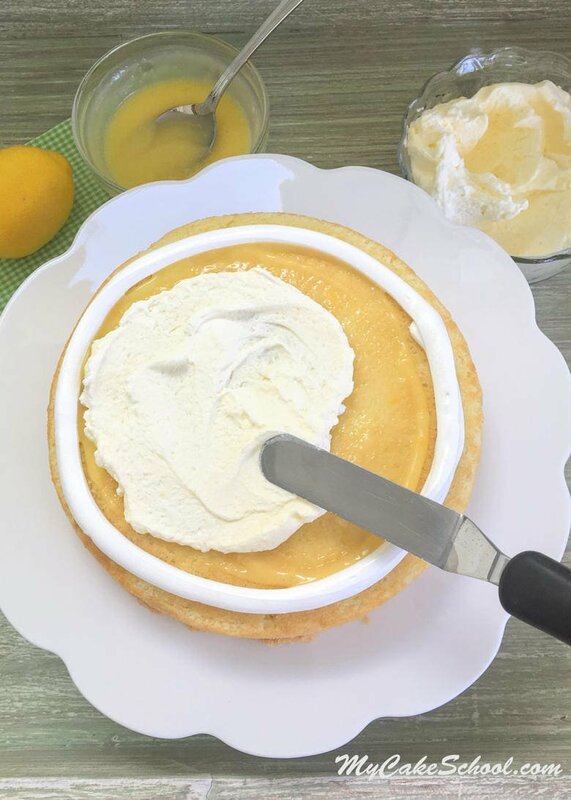 We chose to experiment with a Lemon Whipped Cream Filling, and the result is just heavenly! 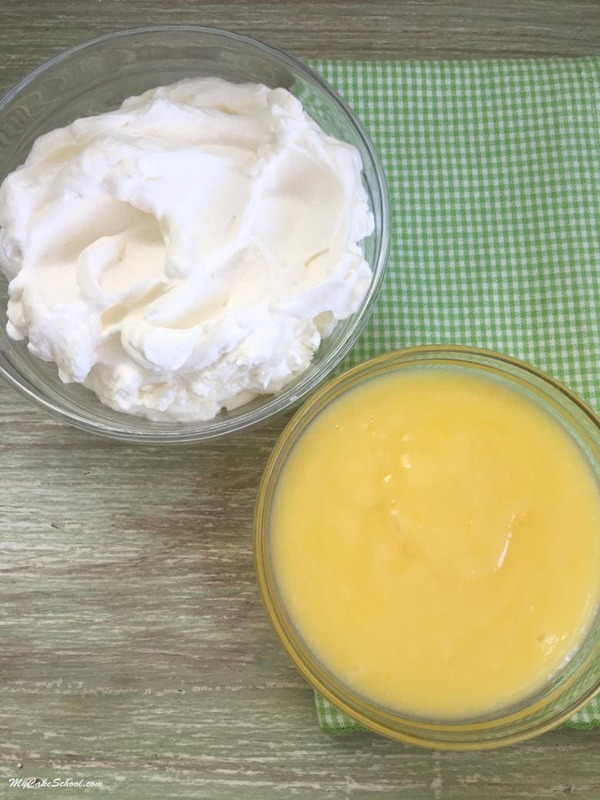 After whipping up a quick batch of sweetened whipped cream, we gently folded in a half cup of lemon curd for a light and luscious lemon cream. We also glazed our layers with lemon curd just before sandwiching the lemon cream filling between our coconut layers. We finished things off with a coating of coconut cream cheese frosting and covered the cake in fluffy flaked coconut. This cake has become an instant favorite for springtime gatherings, and we’re looking forward to having it for our family Easter get-together! You could also create a similar version in cupcake form by making coconut cupcakes with the lemon cream filling and coconut cream cheese frosting! We hope that you enjoy this recipe as much as we have. I’ve made it twice this week already! In a small bowl , combine eggs, coconut milk, oil, & coconut extract. Blend with a fork and set aside. Put the dry ingredients, cake flour, sugar, baking powder and salt into the bowl of your mixer and whisk for at least 30 seconds to blend the ingredients. With the mixer on low speed gradually increasing to medium speed gradually add the slices of butter to the dry ingredients a few pieces of butter at a time. Beat until the dry ingredients are crumbly and moistened. Scrape the sides and bottom of the bowl, there should be no spots of dry flour in the bowl. pourings, scraping the bowl and beating for 20 seconds after each addition. Combine sugar, cornstarch and water in a saucepan over medium heat. Stir constantly, until mixture thickens and comes to a boil (3-4 minutes). Boil, stirring, for 1 minute more.. Remove the pan from the heat. Spoon about 1/2 cup of the hot mixture into a small bowl with egg yolks and stir quickly until combined. Continue stirring, while pouring the egg mixture back into the saucepan. Return pan to medium heat and cook, stirring, until the curd is thickened and lemon colored (1-2 min). Remove from heat and stir in the butter, lemon juice, and lemon zest.-- Let the lemon curd cool, then press plastic wrap onto the surface, this will prevent a skin from forming on the top. Refrigerate. Chill the mixing bowl and beaters (for hand mixer) or whisk attachment (for stand mixer) in the freezer for 10 minutes. Pour the whipping cream, powdered sugar and vanilla into the chilled mixing bowl, begin beating on low speed gradually increasing to medium high speed. Beat until the cream begins to thicken (after approx. 1 1/2 minutes) and soft peaks form….peaks that slightly bend over. Watch closely as this happens quickly. Do not over beat or it will turn into butter. 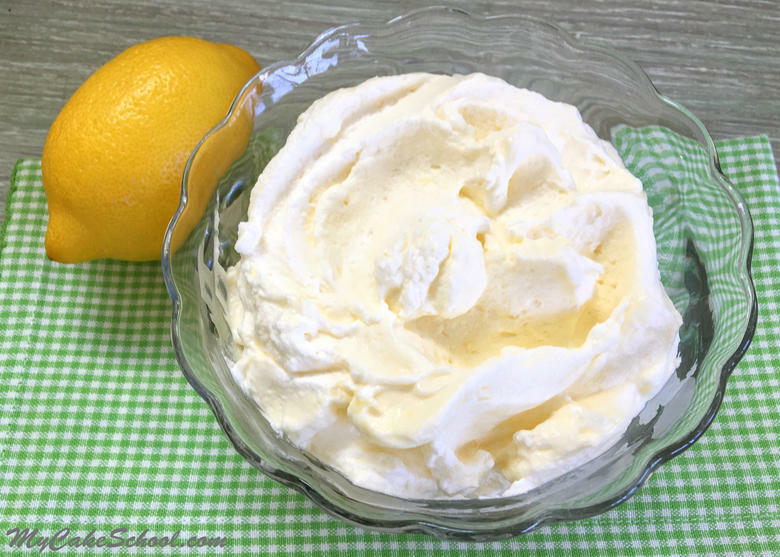 Gently fold 1/2 c. (134g) chilled lemon curd into the prepared whipped cream. You will have leftover lemon curd which you can use to glaze your cake layers before spreading with lemon whipped cream filling. Slowly add the powdered sugar, beating until smooth. Don't beat too long or above medium speed. (The longer you beat, the softer this frosting becomes). Use the frosting while it is still chilled. If it becomes too soft, refrigerate until it firms up a bit. Pipe a dam of coconut cream cheese frosting on the bottom layer (about 1/4 inch within the edge of the cake) before glazing the layer with a thin layer of lemon curd. Spread the layer with lemon whipped cream filling. After the three layers are filled and stacked, frost the cake with coconut cream cheese frosting. Press the flaked coconut into the frosting, completely covering it. For more fantastic cake and frosting recipes, make sure to check out our full collection of favorites in our Cake Recipes Section! 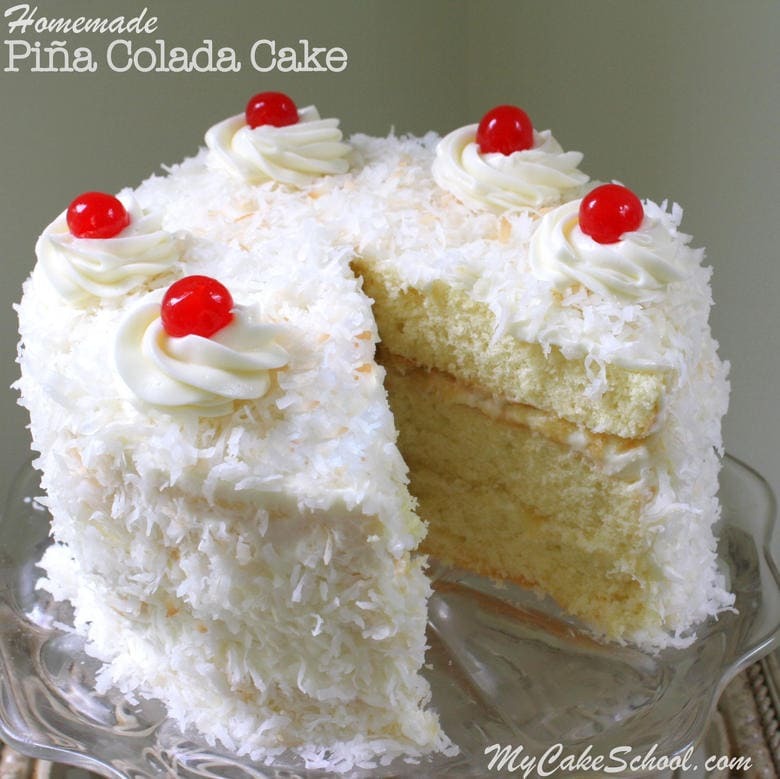 If you’re looking for more Coconut deliciousness, check out our festive Piña Colada Cake! An amazing combination of coconut, crushed pineapple, and a hint of rum! Perfect for summertime entertaining. Thanks for stopping by! 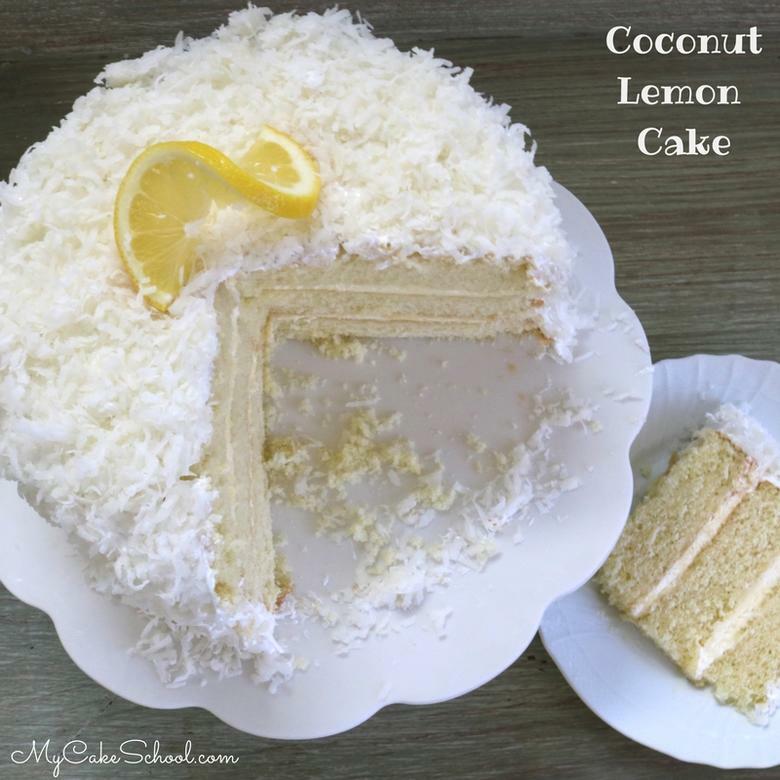 We hope that you’ll give this Coconut Lemon Cake recipe a whirl! If you do, we’d love for you to share your thoughts or cake photos below! *CAKE FLOUR SUBSTITUTE — for each cup of all-purpose flour, measure out (lightly spoon and level) one cup of all purpose flour. Remove 2 Tablespoons flour from the cup and replace it with 2 Tablespoons cornstarch. Whisk to blend. For this recipe you would measure out 3 cups all purpose flour, remove 1/4 cup plus 2 Tablespoons of the all purpose flour and replace it with 1/4 cup plus 2 Tablespoons cornstarch and whisk to blend. Combine sugar, cornstarch and water in a saucepan over medium heat. Stir constantly, until mixture thickens and comes to a boil (3-4 minutes). Boil, stirring, for 1 minute more.. Remove the pan from the heat. Spoon about 1/2 cup of the hot mixture into a small bowl with egg yolks and stir quickly until combined. Continue stirring, while pouring the egg mixture back into the saucepan. Return pan to medium heat and cook, stirring, until the curd is thickened and lemon colored (1-2 min). Remove from heat and stir in the butter, lemon juice, and lemon zest.– Let the lemon curd cool, then press plastic wrap onto the surface, this will prevent a skin from forming on the top. Refrigerate. Chill the mixing bowl and beaters (for hand mixer) or whisk attachment (for stand mixer) in the freezer for 10 minutes. Pour the whipping cream, powdered sugar and vanilla into the chilled mixing bowl, begin beating on low speed gradually increasing to medium high speed. The cream begins to thicken (approx. 1 1/2 minutes) and soft peaks form….peaks that slightly bend over. Watch closely as this happens quickly. Do not over beat or it will turn into butter. Gently fold 1/2 cup (134g) of the lemon curd into the prepared whipped cream. You will have leftover lemon curd. We applied a thin layer to the cake layers just before spreading with the Whipped Cream Filling. You will want to pipe a dam of coconut cream cheese frosting about 1/4 inch from the edge of the cake layers before adding the filling (to keep everything contained). Slowly add the powdered sugar, beating until smooth. Don’t beat above medium speed or for too long. The longer you beat the frosting, the softer it becomes. Looks and sounds delish! Adding that to my must try list :-) Thanks for all the great recipe ideas – awesome! Reversed creaming method is required to yield a moist, fluffly cak2? Lovely cake, one of my all time favorites. Hi Funique, You can make this recipe with either the reverse creaming method or the conventional mixing method. Both will be good. The reverse creaming will give you a slightly more dense cake that is moist, with a melt in you mouth feel. We also have many recipes that use the conventional method that will give you a cake that is slightly fluffier. Is this cake strong enough to use for covering in fondant? Hi Dolly, To get lemon zest for this recipe you will need a microplane or a very fine grater. The microplane is my first choice. You will be removing just the yellow peel of the lemon, you do not want the white underneath. Clink on the link below for a video demonstration. Hope this is helpful.